How To Identify And Shore Up Weaknesses In Your Fitness Preparation - Welcome To Staley Strategies Online Fitness Coaching! I view training as a system, where you attempt to exploit a variety of inputs for the purposes of creating a specific output. For most people, the “output” is typically some combination of stronger, leaner, and/or more muscular. Think of this system as analogous to a factory conveyor belt, where the various components are assembled into the final product. On an actual assembly line, your ability to produce final products will always be limited by the assembly line component in shortest supply. As an example, if your final product requires 8 components, even if you have a limitless supply of 7 components, if you’re short on the 8th, that’s what will limit your final product. 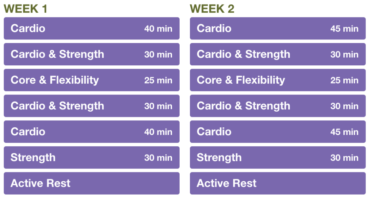 Since your output (fitness goal) is inevitably limited by your weakest link(s), it seems wise to inventory and rank these components in an effort to determine where your efforts should be applied. The first thing you might notice that a few of these components (age, genetics, past injuries) are not within your control. For that reason, you can scratch them from your list. Once that’s been done, my suggestion is to rank each item in order of strongest to weakest. Or to put it another way, the first item on your list should be the one that is least in need of fortification. So if you have a membership to a fantastic gym and your nutrition is totally on point, those might be your first 2 items. On the other hand, if you find yourself constantly battling nagging injuries, and you’re not confident in your programming, those items might be at the bottom of your list. First, place a high priority on self-education. Thankfully, information is plentiful and cheap, so this involves nothing more than some sweat-equity on your part. None of us can be experts in numerous fields of study, so my recommendation is to find a handful experts you trust, and use them as filters so that you’re not floating like a cork on a sea of information. If you need some help this department, leave a message in the comments and I’ll help you out. Once you complete this step, you still might find yourself confused when two or more of your trusted experts disagree on a specific topic. If and when this happens, first seek to determine if the issue at hand is significant or not. For example, supplementation is a very minor contributor to fitness goals, so if two experts disagree on a specific supplement, it’s really not worth spending much time worrying about who’s right on the topic. Also, in your educational efforts, focus more on principles than methods. If you truly understand the former, the latter will take care of itself. As a quick example, a kay principle related to fat loss is that energy balance — if you consume less energy that you expend, you’ll lose body fat. Knowing this, when you find yourself evaluating the comparative merits of 2 different fat-loss diets, consider which approach will make it easiest (for you) to consume fewer calories. Secondly, consider finding a coach or mentor. Yes, I realize that this represents a form of education, but it’s the best form of education as it turns out, so if you’ve never hired a coach (and this might include anything from a personal trainer, strength coach, and/or nutrition expert), this single factor by itself might be exactly the thing that finally propels you to the next level. When it comes time to do your taxes, get your bloodwork done, or learn a musical instrument, you’d hire an expert, so why would fitness be any different? To wrap this up, you might find my list of components above to incomplete, and so if you’ve thought of a few that I haven’t, by all means add them to your list. In fact, if you decide to take me up on the self-analysis that I’ve presented here, I’d love you to share any realizations you might have uncovered in the comments below — what aspect of your fitness prep is strongest, and which one(s) is weakest?